It is that time of year again, mowers constantly and noisily running across the neighborhood, smells of steaks wafting though the air, children shrieking in pool-time excitement, and all the hours of garden preparation looming in the back of my mind. I will happily say I have not had to trim the hedges this year, though I did have to rescue some the supplies I used on this topiary from the trash bin. Ya, gross. Select your branches. You want to choose fairly thin, fresh clippings so they are still malleable. I bought this mess-backed moss sheet at Michael’s. They had a variety of mosses, but I liked the color and the ease of the sheet the best. I believe it was around $6.00 for the whole sheet. I used a coupon, payed about half and only used half of the sheet. 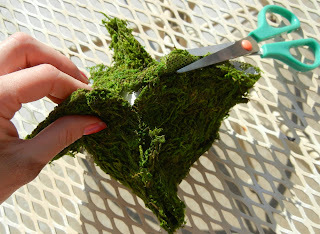 Fold the moss sheet around the Styrofoam ball. I used 3” Styrofoam balls and 8-9” square moss sheets. If your ball has a hole in it make it visible at the point where the edges meet. I remember playing a game as a kid that reminds me of the way I folded the moss. Do you remember that origami-like, folded paper game with words and numbers written under flaps? If you have no idea what I am talking about just fold the corners together and trim the excess. Navigate one covered ball onto one stick. Push the first moss ball into position guaranteeing room on either end to insert the remainder of the stick into the pot and into the second moss ball. Once you have determined which end will hold the second ball lodge a second stick into the first ball and twist the two sticks together. You may want to add a willowy branch to hold your sticks together as I have. Then thrust both sticks (together with the 3rd twig) into the bottom of the top moss ball. You will likely have a pot around the house if you look long enough. Otherwise, you can pick one up just about anywhere and they are very inexpensive. I touched over the pot with a dusting of pewter and dark brown spray paint. (It is a good idea to have some basic spray paint colors on hand, especially those to match colors common to your household.) The terra cotta was a bit bright for my house. You will want to consider painting the pot if the color is not a good fit for your room. I placed some floral foam in the bottom of the pot to secure the branch and added some of the excess moss as filler. Insert the bottom branch into the pot and fill around the top with the moss trimmings. If you are not feeling adventurous tie your bow and stop here. But, if you want to put a spin on the topiaries you have seen in the store try this next step. You only want to use freshly cut twigs and evergreen clippings. Preferably you will use a soft twig that is already curved like the one below. Bend the twigs around the moss ball intertwining and lacing the limbs over each other. Use a hot glue gun if you need to secure the twigs, otherwise, find a spot to fasten the branch back into the moss ball. Add clippings from a boxwood shrub or other evergreen. Tie some brittle pieces of wood into your bow to complete the look. Please keep in mind the color that will surround your topiary when choosing a ribbon. Voila! A trash (literally) to treasure topiary. As I promised on Monday I would show an alternative idea for the bird nest pendant...can you find it in the topiary? It is perched on the top of the bottom moss ball above the knot in the bow. Wow! It looks so cute:) I really like it!! Really easy...thanks for following. Give it a try. If you run into problems ask me questions.